Calico has had worked on its fair share of designing hotel rooms, and we know that sometimes people want to replicate that luxurious hotel experience at home. So we’ve compiled a few tips to help you create that comfort in your bedroom. The best part of a hotel room is the bed. It’s designed to be the focal point of the room, and you know it’s so comfy that you instantly flop down on to it as soon as you open the door. To recreate this feeling at home, start with fresh sheets and thick blankets, topped with plush cushions and bed throws. When it comes to replicating the style of a hotel room itself, there are many styles that hotel rooms usually have, such as oversized headboards and large sizes. The most important thing here is that the fabric matches the bedding. Hotel rooms ensure that you have a good night’s sleep when you stay, and so the curtains are usually blackout, which you can also have in your home. In a hotel room, there is a space for everything, whether it be a somewhere to read, get ready in the morning or even for your cup of coffee. Therefore, you should decide what you will be using the bedroom for, other than sleeping, and design the room accordingly. A mirror, a writing desk, a large, comfy chair, having access to items like these in your bedroom will add to the hotel-like feeling, as everything you need is all in one room. Lighting plays a crucial role when furnishing hotel rooms, as they create the right ambience thus creating the right atmosphere. Try placing table lamps either side of the bed for reading light, as well as one near your vanity mirror for a touch of glamour. Don’t forget to use decorative light shades that draw attention, as the fanciest hotels often use the more extravagant lighting! It’s not just the furniture that creates a luxurious hotel feeling. A fluffy blanket thrown over a chair, a soft rug, an intricate tray to balance your coffee cups on when having breakfast in bed. All these accessories help make up an opulent atmosphere. These touches emphasise the furniture you have, creating a homely feeling so that you’ll feel welcome in your bedroom. Add in your personal items, such as photographs, books, and makeup, and you’ll soon find that you have a luxurious bedroom that you will never want to leave. Many of us already have an idea of what they want their Christmas tree to look like. It could be that all decorations are under one colour scheme, or you’re using the baubles that you’ve been collecting over the years, creating a personal and homely effect. However, for those who are wanting to change things up this year, here are a few ideas that we think you’ll love. This is the theme of our tree this year. A basic white colour creates more of a statement look in your home. It can appear as more glam and contemporary, and you don’t necessarily need a white tree or one with frosted tips to pull it off. To start, focus on the lights. The advantage of using crisp colours like this is that it’s pretty easy to match. Cool lights are a go-to, but, for a pop of colour, we recommend using warm lights, such as gold or even blue ones, which is also a popular option. It takes away from the harshness of the white design and will help draw attention to the tree. Gold lighting will also emphasise the greenery. Blue, on the other hand, will add to that cold, frosty feeling that, combined with rich and cosy textures throughout the rest of your home, can create maximum comfort. Now, for the baubles. Silvers, whites, and pale greys are ideal for this style of tree. We recommend adding a mix of textures when you can, such as wooden and glass decorations. We have lovely clear baubles for sale in our showroom if you’re interested. Blues and purples can also be thrown in for a dash of colour. Choosing baubles that have coloured accents is another way of incorporating a range of colours and textures, like our feathered baubles that are hanging up on our tree. Not one for traditional shapes? We have silver glittery apple baubles from Parlane if you’re looking for something different. If you want something out of the box, try poking in some fake flowers, as we’ve done with our tree. They add some contrasting textures to the tree itself and helps bring the outside in. Gold screams warmth and festivity and is a timeless colour for a Christmas tree. It can give your home a somewhat regal look that will glow in your room, and provides the perfect opportunity to add some glitter! Gold fairy lights are ideal for this look, without it becoming too overpowering. Just keep the greenery emphasised if you’re still unsure. Regarding decorations, you can stick to gold tones, or even throw a few red ones in there. Ginger colour (or even homemade gingerbread!) also works, as do wooden decorations. We have a collection of bronze-speckled baubles for sale as well. This colour palette gives you the opportunity to incorporate stars, pine cones, and red berries, especially if you want more of a traditional look. We have quite a collection of stars in our showroom, and not just for the tree. Got some gold ribbon? Add some bright bows to finish the look. Our see-through baubles work just as well for this style, and we also have glittery hearts if you want to go for a more playful, laid-back look. If you’ve fallen in love with this year’s minimalist trend, you can easily create this look for your tree. This involves embracing your tree and letting it do the talking, adding only a small amount of the simplest decorations for an understated yet classic look. Stick with traditional pine forest trees or ones that are denser; frosted-tip trees don’t suit this theme as much. Start with twinkly gold or white lights that aren’t too flashy or in your face, and entwine them gently amongst the branches. Some people stop there and leave it be, but if you feel that this is too simple, then keep reading. Neutral ornaments, such as pale greys, light bronze, clear and silvers work well here. You can even add a few glittery ones that would look beautiful when the lights reflect on them. We have many neutral-coloured accessories that could work here, such as our small white birds, which would stand out against the green pine tree. Or, an alternative would be to skip the baubles and scatter a few bows across the tree, for a look that is both regal and minimalist. The advantage of having a simple tree is that you can use whatever colour ribbon you’d like. We think that red bows would make a stunning contrast with the greenery. We’d love to see how you’ve decorated your Christmas trees this year. Tag us in your photos on social media and we may even give you a mention! If you’d like to see more of our Christmas stock, click here or come pay us a visit. We announced yesterday on our social media platforms that we now have an extremely large range of fabric remnants for sale. But, for those thinking, What on earth would I want scraps of fabric for? here are a few ideas if you’re feeling crafty. This versatile little pouch can be used for make up, keys, money, or even project supplies. This one includes a zip, but you could use buttons, poppers, whatever you like! Perfect for this season. Wrap up warm in your own personalised blanket or throw, made by you. You could make little patchwork quilts for the little ones, like this one, or a festive-themed throw, or a brightly patterned blanket that will stand out in your bedroom. These are so simple and doable, and could make the perfect stocking filler for bookworms (those guys love bookmarks!). Kinda goes with the bookmarks, but these cute notebook cover make cheap, personalised and cute little presents for your family and friends. You can even use notebooks or sketchbooks to suit their needs. Everyone needs a notepad at some point, so you know that it’s a gift that won’t be gathering dust. Here’s an example. Ideal for this miserable weather. These pads can be thrown into the microwave and serve as mini hot water bottles. They’re small enough to fit in your bags, so you can warm your fingers on the commute to work, and they’re the perfect size for the little ones. Everyone needs a pillowcase. Not only do they provide comfort, they also add a finishing touch to any room. These would be great if you have family staying round for Christmas - just imagine a guest room with personalised pillows. Take a look here. These adorable little gifts make really good stocking fillers, for all ages. Another opportunity to create a personal gift. These are probably the cutest things ever. Coffee cups burning your fingers? Flask too hot to carry? These cup sleeves are the perfect solution. Why settle for a cardboard Starbucks one when you could have a decorative one that’s softer on the hands? Add a bit of comfort to your camera strap. The perfect gift for photographers. Click here to see how. Again, a gift that can suit anyone. Handing over a custom-made passport holder will certainly put a smile on people’s faces, and you’re sure to feel proud of yourself for making such a lovely item. See here. There are so many things you can do with fabric remnants, but we’re going to stop at ten. Hopefully you now feel inspired to get crafty this Christmas, whether it be for your family, friends, or even yourself. We are selling our fabric remnants for £5 per metre, and we have a huge range. Come visit our showroom to find out more. We found these crafts on Pinterest. If you want to see more of our showroom and recent projects, give us a follow. One of our recent projects was at a home overlooking the River Wye, where we created window treatments and soft furnishings for a sitting room and bedroom. The customer loves Scandinavian designs, a huge trend this season. We designed our products to match the furniture that the client had already purchased, bringing in accents of blues and greens that stood out against the woodland tones. The Scandi trend is inspired by the Danish concept of hygge (pronounced ‘hue-guh’), which is used to highlight that moment of happiness where you create intimacy, whether that be alone or with friends, home or out of the house, as long as you are surrounded by ultimate comfort. As already mentioned in our Interior trends for our AW2018 post, it is the perfect trend for this season, simply because of its cosy home décor. A chic aesthetic is balanced with a minimal touch, adding to the idea of peace and mindfulness. A house that looks over a beautiful setting like the River Wye is just waiting for a Scandinavian make over. The furniture that the client had supplied included a sofa and blue and green cushions, and so we selected fabrics that complemented these hues. We used fabrics from Romo Linara and Lorcan collections, as they had a wide range of neutral colours and classic designs that suited the brief 100%. We made and installed Roman blinds using ‘Sefina Duck Egg’ from the Lorcan range. This understated floral print gave a soft accent to the room while incorporating nature, and it’s printed on to a linara based fabric, producing a delicate finish. This also paired with the greenery that the customer bought, another common theme when it comes to Scandi interiors. This Lorcan range was designed to complement the Linara fabrics, which has over 360 colourways including plenty of neutrals that we used in this project. We created more cushions that matched those on the sofa, and pinch pleat curtains in the same fabric as the blinds. As well as this, we made Roman blinds for the bedroom onto existing poles. We love this transformation of the sitting room. It’s an on-trend design that is perfect for this season, and with a backdrop of the River Wye emerging through the windows, its toned-down rustic look emphasises the beautiful Forest scenery. Since we put up our new Villa Nova Picturebook display and started working on the kids’ playroom at our village local, it’s safe to say that we’re very focused on the little ones this season. Therefore, we’ve compiled some useful tips to help you renovate your children’s bedrooms. If it’s their first ‘big’ room or they’ve outgrown its current scheme, we’re here to help you create the perfect child’s space. Colours and patterns are where its at for kids. They love things that are bold and bright. One good way of doing this is by pairing your child’s favourite colour with neutral shades, as this can help retain a timeless look that can’t be outgrown as easily. Neutrals have the advantage of longevity, and by matching these with colourful accessories and features will make it easier to swap the design around as your child grows. Another way of incorporating colour is to use feature wallpapers. Many kids’ wallpapers are busy and bold, so they will balance nicely with more toned-down styles. Prints that showcase your child’s interests is a great way of adding personality to a room, and with such a wide range of children’s wallpapers out there, you are sure to find one that is ideal for your child. We personally love ‘All My Books’ wallpaper by Harlequin, which provides a more fun and modern take on the traditional library wallpapers that are trending right now. This is perfect for bookworms-in-the-making, but if your child is more of an arty type, the ‘Scribbler’ wallpaper by Sanderson is ideal. Harlequin’s ‘Sail Away’ wallpaper is a lovely option for those who love adventures by the sea, also by Harlequin. Nature is a huge trend this season, and not just for adults. Kids love animals, colourful flowers and exploring new worlds, so why not incorporate these into their bedrooms? Their imaginations will run wild with the amount of prints out there, such as Villa Nova’s Picturebook collection. The prints designed by Frann Preston-Gannon and Yuval Zommer feature jungle animals and teeny insects, and would make fun additions to a kid’s bedroom. There are also sea-life and Arctic-inspired designs available, perfect for a nautical scheme. The ‘Arctic Antics’ fabric use multiple textures and hues to bring the ocean to life, complete with polar bears and seals. This fun design has many uses, so it’ll be easy to incorporate it into your home. Floral prints are another great option if your child has a passion for the outdoors. If it’s a girly room you’re after, flowers work perfectly, and there is a wide range out there for you to choose from. Harlequin offer many choices when it comes to floral prints, such as ‘Ditsy Daisy’, a charming daisy motif printed in three different colourways. Or, as a twist to a simple floral design, ‘Pretty Ponies’ by Sanderson feature ponies inlaid with intricate flowers. When it comes to window treatments, black out lining is an essential for children’s rooms, especially for the little ones. Preventing any light coming in to the room will guarantee a good-night’s sleep for your child, helping them feel more refreshed and lively in the morning. Blinds and shutters are more popular than curtains when it comes to kids’ rooms, as they are better at keeping out the light and can come with motorised controls that can be kept out of the way of little fingers. Venetians are ideal here, as they offer good light control. 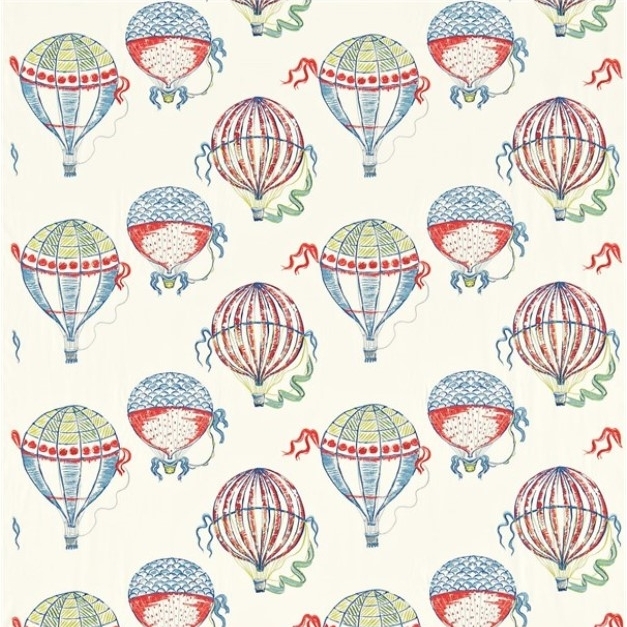 These blinds that we created here using Sanderson’s ‘Beautiful Balloons’ fabric would be perfect for a child’s room, as the design features whimsical hot air balloons that are bright and bold, adding to a colourful colour scheme. But just because you’re trying to keep it as dark as possible at night, doesn’t mean that you can’t provide some ambient lighting as your child settles down. After all, who doesn’t love reading a bedtime story next to the comforting glow of a night light? Storage is one of the most important things to consider when it comes to a child’s bedroom. Children usually have a large number of toys and teddies when they’re little, and this continues throughout most of their childhood. When school starts, they have books and stationary to think of. Fortunately, there is a wide range of storage for you to choose from and designed to suit your desired age group. Baskets are a good option for the little ones who have lots of toys, as this means that they can be picked up and put away as quickly as they are taken out again. Drawers are good as the child grows, as they can be used for anything from clothes to stationary. Wanting to decorate them? Simple touches such as adding framed photos or artwork will provide a nice homely touch. Camelot Pictures offer a wide range, from woodland creatures, flowers and dancers. A more on-trend storage idea is using window seats. Having a window seat as storage can help maximise room space and add an element of surprise for young children. We’ve created many seat pads for window seats over the years, but some of our favourites include Forest Guest House and for this private client. Our last tip is to add small touches and accessories to help give your child’s room a homely feel. Villa Nova’s cushions from their Picturebook offer a range of coordinating cushions that match their collections, as well as rugs and wall stickers. We adore the ‘Tiny Turtles’ cushion, as its playful, simple and yet effective. The ‘Treasure Map’ cushion by Sanderson is bold and busy, in true childlike style, and comes in two colourways so you can add it to multiple schemes. We can also make cushions using your desired fabrics in our own workroom. The joy of designing children’s bedroom is that there are so many options, from whimsical to dainty, to busy and colourful to simple and intricate. But, if you’re struggling to choose, feel free to come visit our showroom and our designers will help you create a room that your child will fall in love with. One of the many projects that we undertook this summer was the furbishing of two different rooms in a family home, situated in Thurston Rise, Coleford. The new build is part of a housing development that was completed recently on Staunton Road. A contemporary lounge and master bedroom were designed, featuring geometric prints and a contrasting colour scheme. The design of the lounge was clean and simple, paired with bright furniture to add a pop of colour. The blind showcased this perfectly, as we added a blue patterned braid from Osborne & Little to contrast the pleat curtains that were supplied by Romo Fabrics. The neutral colour on the walls, accompanied by printed featured wallpaper, allowed us to introduce many colour combinations. The customer supplied a bright yellow chair from DFS, and we added a grey TV unit to contrast. The room was completed with a Villa Nova rug to add some texture to the homely design. The master bedroom featured a more neutral colour scheme, with a teal wallpaper that emphasised the various patterns used for the headboard and blinds, including a dandelion print that channelled the Forest of Dean. This created more of a relaxed but modern feel, perfect for a bedroom. It matched the lounge perfectly, through the grey cushions and the touch of blue in the printed headboard, tying the overall house together. This family home was a fun project to work on. The clean and simple walls allowed us to play with geometric prints and patterns, creating a contrasting design that was contemporary with a homely atmosphere.